Sean Kelly announces Shapeshifter, an exhibition of new work by Nathan Mabry. This is the artist’s first exhibition with the gallery and will include sculptures from two different series of work. Mabry’s Heavy Handed (Separation Anxiety) and Heavy Handed (Tocca Ferro/Horns Up) will be presented in gallery two. 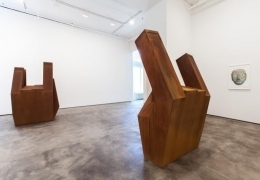 The Heavy Handed works are large-scale sculptures made of steel that resemble block-like human hands, making gestures ranging from the benign to the profane. They reference sign language, colloquial symbols and other forms of gestural communication that can be simultaneously illustrative and provocative. shapeshifting, achieved through the use of hallucinogenic drugs. Mabry’s heads incorporate animals commonly associated with Chavín iconography, specifically jaguars, eagles and snakes. The stark contrast of these ancient figurative forms to the cool reserve of their abstract minimalist bases creates, in Mabry’s words, a “crashing together” of cultural aesthetics; this juxtaposition of ancient and contemporary is a common theme in Mabry’s oeuvre. 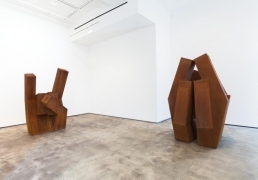 Shown together, these two bodies of work offer an opportunity to see the broad range of Mabry’s sculptural vocabulary, his complex visual language and his underlying use of humor to connect with the viewer. 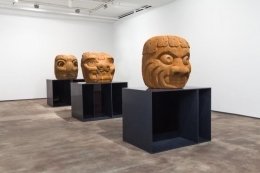 While the exhibition title, Shapeshifter, is a specific reference to Chavín iconography, it is also a reference to Mabry’s ability to move between artistic styles and find inspiration from varied sources. Nathan Mabry received his BFA from the Kansas City Art Institute and his MFA from the University of California, Los Angeles. His work is in the permanent collections of numerous institutions including the Whitney Museum of American Art, New York; the Los Angeles County Museum of Art; the Hammer Museum, Los Angeles; and the Museum of Contemporary Art San Diego, La Jolla. His work has recently appeared in exhibitions at the Hammer Museum, Los Angeles; the Museum of Contemporary Art San Diego, La Jolla; the Parrish Art Museum, Southampton; the Las Vegas Art Museum; the 176 Zabludowicz Collection, London, and the Vanhaerents Art Collection, Brussels. Mabry will be the subject of a solo exhibition, Sightings, at the Nasher Sculpture Center in Dallas, which opens April 13th and runs through July 17th. Concurrently, in gallery one, Sean Kelly will present Meshes of the Afternoon, a group painting exhibition. by Paul Laster, BOMBlog, April 30, 2013. "Nathan Mabry Gets His Pre-Columbian Groove"
by Susan Michals, The Huffington Post, April 26, 2013. "Ten Sculpture Exhibitions You Should See"
by Howard Halle, Time Out , April 23, 2013.